Bacon and cheese crock-pot potatoes is a wonderful side dish that you can make in your crock-pot. I got the inspiration for this recipe from Moms with Crock Pots website. I don’t know why, but I have been been on a big kick of using crock-pots lately. It must be the weather cooling off, this is the first weekend, we have been below 80 in Houston since May. I know for folks up north, that is nothing, but for those who live in the south, this is when you know the cooler weather is coming. I never thought you could make a side dish of potatoes in a crock-pot, and when I saw a pin on pinterest, I knew I had to make this recipe. 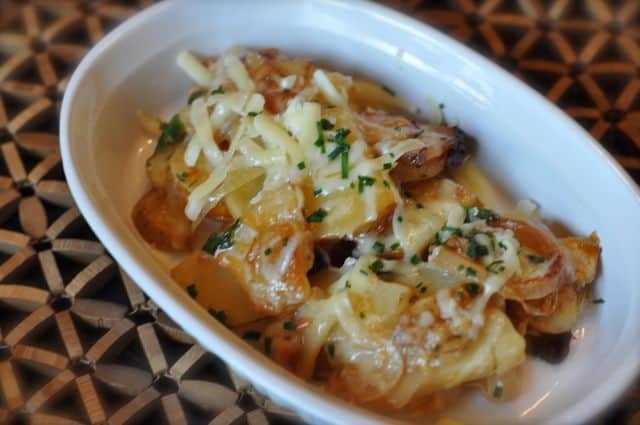 Potatoes, cheese, bacon, and onions are a classic taste. What I like about this recipe is that it is very easy to make. I reduced the cooking time from 10 hours on low to 4-5 hours on high. I also suggest that you put on half of the cheese during the cooking, and then once the potatoes are done, turn off the heat add the remaining cheese and top with green onions. Crock-pot cheesy bacon potatoes are the perfect side dish. Line a 6-quart crock-pot with foil (this will help keep your crock-pot clean). Slice potatoes in half horizontally, and then vertically. Sliced quartered potatoes into approximately 1/4 inch slices. Line the bottom of the foil line crock-pot with a layer of potatoes and garlic. Sprinkle salt and pepper on the layer of potatoes and onions. Add remaining sliced potatoes and onions season with salt and pepper. Add chopped bacon (you do not need to cook the bacon before adding to the crock-pot), add 1 cup of cheese, and dot with 3 tablespoons of butter. Cook potatoes on high for 4 - 5 hours, or on low for 8 - 10 hours. When the cooking time is done, top with remaining 1 cup of cheese, and sliced green onions. I’ve never made potatoes in the crockpot, but that sounds so good! Can’t wait to try these delicious looking potatoes! I hope you enjoy these potatoes. I use cheddar, or Monterey Jack cheese. Try this with regular fresh chives or fresh garlic chives. I think you need to add those very late if you are going to add chives. I think they may turn into mush if you add them in for the whole cooking time. I bet these would be amazing with fresh chives. Looks so delicious, I’m trying it tomorrow!! !